Summer is almost over, at last. At long last. The days feel different — it’s still dark when I wake up in the morning, and by late afternoon the light has that amber tinge that signals a change in the season. It’s time for a shift, away from the hectic and hot days of summer, and towards my favorite time of year. It’s also time to get back to knitting. I’ve been so busy that I haven’t had the energy to do much besides work and sleep. I picked up this forlorn sock the other day, and realized that I need to knit as much as I want to knit. My hands have missed it, and my brain has missed it, too. 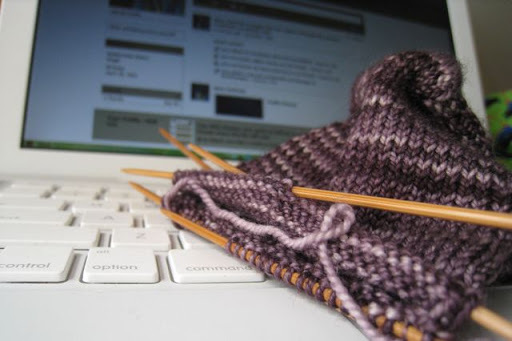 So I’m plugging away, a few rows at a time, and dreaming of knitting something new. What it will be, I don’t know. But it has to be new. All the projects that are in various states of completion will have to wait. I need to start something. About a year ago, when cancer was where I lived, I had to have a chest port implanted so I could begin chemotherapy. A few weeks ago I had the procedure to remove it. I was surprised to find that I had mixed feelings about it — Portia, as I called her, was never an easy one to get along with. She pulled, she ached, she malfunctioned at the worst possible moments (just as I was about to receive the Big Bad Adriamycin, not once but twice). She made herself a nuisance. But on the other hand, Portia was a means to a good outcome. She made it possible for me to receive the drugs more safely and with less discomfort than if they had had to be infused through a vein. She did her job, most of the time. So when I was officially done with chemo, I lobbied Dr. Pearl. I wanted to be rid of Portia as soon as possible. When he agreed, finally, and the date was set, I was so happy! I couldn’t wait — but there was something else, too. Portia had helped save me, and what would I do without that little plastic do-dad to reassure me? To be honest, I was scared. Having a port meant I could be treated, and being treated meant I could be well. What if…? It wasn’t until I caught a glimpse of her as the radiologist was tossing her away that I knew I didn’t need her any more. Goodbye, my fickle friend, and thank you. I joined Facebook today. Or rather, I joined and ducked for cover. It was a whim, indulged with a few clicks. What was I thinking? That I was missing something? That I need to be so casually connected with the whole world? That I will be willing to spend even more time tweaking and arranging yet another version of my public self? Yes, yes, and yes. Oh, well. Someone please tell me it will be fun. At least I have been reading (it’s part of my job, after all). Four books have had my attention in the past few weeks. Sweeping Up Glass by Carolyn Wall is a well-told story about a woman who tends to take care of everyone. There’s a bit of a dramatic story there, too, but I liked the book because I liked the character. The Girl with the Dragon Tattoo by Stieg Larsson is so wildly popular that I felt obliged to read it. I don’t do suspense/thriller/mystery much; I want memorable words and characters, and this genre is usually heavy on plot and light on character development. But this time, the Girl pulled me in. She’s fascinating, and I so wanted to see where she was heading that I read the book in just a few days. It’s not for everyone, so don’t think you have to read it just because everyone tells you it’s fabulous. Reading is supposed to be pleasurable, after all. Await your Reply by Dan Chaon is just brilliant. Are we who we think or say we are, and do we get to decide? I’ve never read anything like this book, and I don’t want to do it an injustice by trying to tell you more about it. The book I’m just finishing now is Strength in What Remains by Tracy Kidder. It’s a true story about a man who escaped the genocide in Burundi and Rwanda and made his way to New York, eventually becoming a doctor. I spent so much of the past year becoming aware of and testing my capabilities that I came to this story with what I thought was a little bit of understanding. I’ll never know though, what it takes to simply survive through the night, what just being really means. I’m a piker. The Internets are calling. There’s this thing called a wall, and one of my nieces just friended me, and I think I’m supposed to think of things to actually write on the wall. Right? there is a wall? I don't know of such things myself .. I've avoided the whole facebook thing until very recently and then only relucantly joined as my current head of section is there and messages staff that way. Me I like to hang out with the knitting crown on line … I'm so pleased that Portia has done her duty admirably and is now no longer needed. Go well (which is what my south African friends have to say when one parts company with friends) and Ka kite ano – which is Maori for until I see you again, Stella. It's good that Portia decided it was time to move on. She did her job. Ah the Wall. I joined Facebook recently mostly because one of my Yahoo groups moved to Facebook. I still don't have the hang of it. Yes, Facebook is another on-line version of your public self. Well put. (I haven't gotten into it either. )As for Portia; a great friend knows when to step in to help and when to let you go it alone.Congratulations. So good to hear from you, that you are knitting and that our journey to wellness is progressing. I use Facebook mainly to keep in touch with my kids who are both away at college. Many the time I have read their status and been able to send them a little message to cheer them up – when otherwise I wouldn't even have known they were sad. Portia's gone buh bye just like the cancer – great news!!! Glad you are knitting again! Farewell Portia, and thank you for doing your job so well! As for Facebook – it grew on me, but I still have few "friends" – it's amusing, but not vital to communication. Goodbye, Portia. Thank you for helping Jane so much! !I decided that Facebook and Twitter would be just too much, so I'm resisting. Great to see you again, Jane. I too had a similar Portia for over a year. I was glad to see her gone and her memory lingers on in the form of a scar and a beat up kidney…But life is good and we are still here. I'm really excited that if you start something new, there may eventually be pictures of finished, or even semi finished things and then I can experience that same inspiration that got me started ….looking at your work.Hurray. I always love to hear what other people are reading and I enjoyed your concise book reports. I had been curious about the Stieg Larsson.